Maurice Prendergast, Revere Beach No. 2, between 1917 and 1918. Watercolor on paper, 13 1/2 x 19 1/2 in. The Phillips Collection, Washington, DC. Gift of Mrs. Charles Prendergast in memory of Duncan and Marjorie Phillips, 1991. 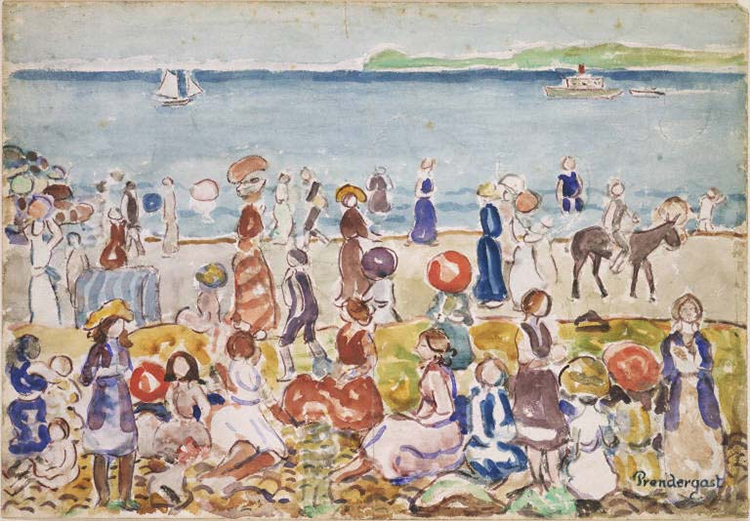 This watercolor by Maurice Prendergast captures the colors and bustle of a summer day at Revere Beach, just five miles north of Boston. Its hard sand shore forms a great crescent for four miles along the blue ocean, sloping away gradually out to sea and creating an ideal bathing beach. The Nahant and Winthrop peninsulas frame the horizon at Revere Beach, which faces Massachusetts Bay. An ad in a 1912 booklet advertising Revere Beach described unsurpassed scenic panoramas viewed from the beach by day or night. From the time it opened to the public in 1896, Revere Beach entertained visitors from all over the world each year from Easter until Labor Day. In the early years they walked, bicycled, or took horse-drawn carriages. It was the place to go to be entertained, have fun or just relax and enjoy a day at the beach. This entry was posted in Experiment Station and tagged beaches, Maurice Prendergast, summer, watercolor. Bookmark the permalink. One thing special when Underground went away in 2014.